This is a title I never thought I’d write! 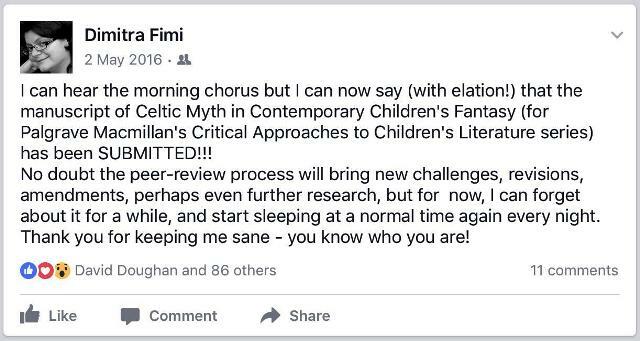 But, having finished another book (submitted exactly a year ago today!) I’m in that reflective mood again, thinking back to some important moments and turning points. Researching and writing a monograph is like going on a journey without a detailed itinerary. You sort of know where you want to go but you don’t quite know what is the best way there, or what places you absolutely must stop and visit on the way (so that your final destination becomes worth reaching). 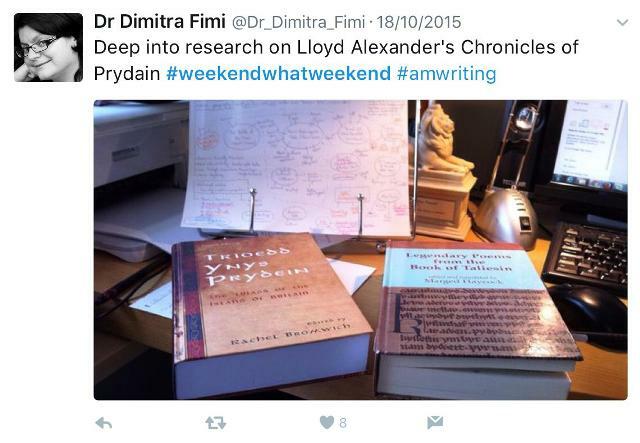 My first monograph was based on my PhD thesis – so it was, really, an act of re-writing. 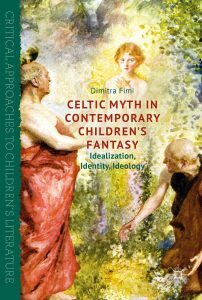 But my latest book, Celtic Myth in Contemporary Children’s Fantasy, was a different story: I thought about it as a book, right from the beginning, and did a lot of the research (and thinking!) for it during maternity leave. Not much writing at all happened during that time (baby in the house! ), but a lot of close reading of primary sources (lots of children’s fantasy novels – quite apposite while getting used to life with a little one!) and a lot of thinking and note-taking (mostly on my phone while feeding, nap-time, etc.) Then, came the digging further into the Irish and Welsh sources my fantasy authors used (a lovely opportunity to go back to my MA in Early Celtic Studies reading and catch up with the scholarship since then). Also, a thorough read of interviews, lectures, reflective essays and blogs given/written by my selected authors (how lovely to be working with contemporary authors! ), and – in many cases – a conversation with the authors, either face-to-face, or by email. In the case of the late Pat O’Shea, her partner Geoff Windle was so generous with his time in answering my emails and giving me an insight into her bookshelves and research. Also, my research on Lloyd Alexander was enriched by consulting his manuscripts at the Free Library of Philadelphia, though I never set foot there… but that is letting the cat out of the bag!!! 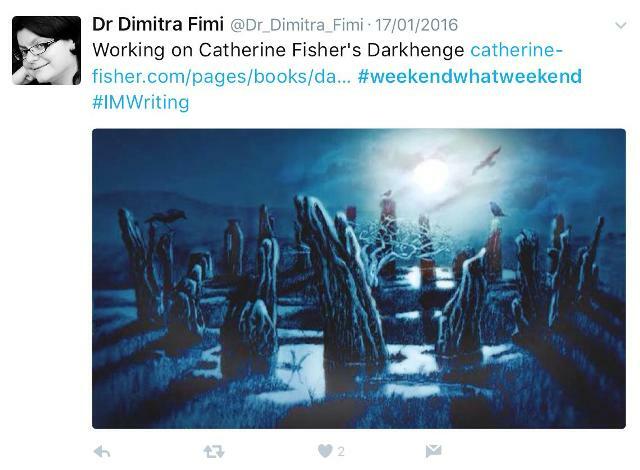 So during that research journey, there were times were I needed help: a quick chat with an archaeologist friend about Seahenge in Norfolk (which was part of the inspiration for Catherine Fisher’s Darkhenge); a question to Welsh speaking friends and colleagues about an obscure (or imaginary?) Welsh word Alan Garner describes in The Owl Service; a telephone conversation with a former tutor about Roman helmets (for the chapter on Susan Cooper’s The Dark is Rising Sequence). All of these friends and colleagues are thanked in the book’s acknowledgements. 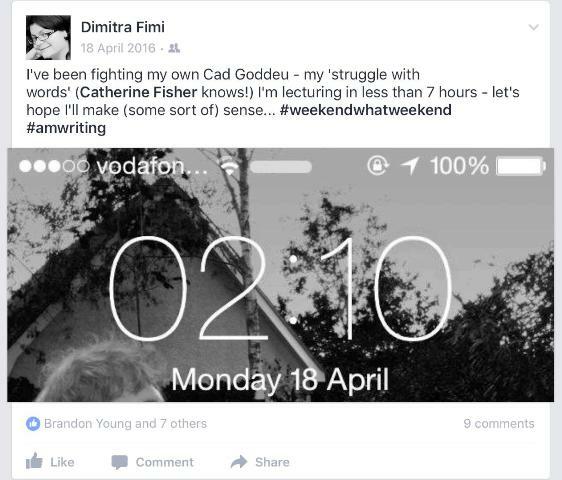 But there were also times when I (nearly) hit a dead end, and that’s when Facebook and Twitter came to the rescue! I was able to directly contact Jenny Nimmo because of Twitter. A series of messages there led to exchanging email addresses and a great conversation on The Snow Spider trilogy. 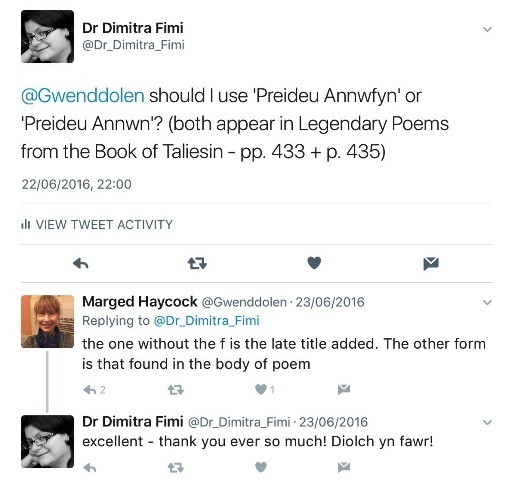 Twitter was also the only way I managed to get hold of Marged Haycock (the editor of The Legendary Poems from the Book of Taliesin) and get a quick clarification on the title of the Welsh “Preideu Annwfyn” (The Spoils of Annwn). As for Facebook, that’s where I moaned about not having a “portkey” for immediate transportation to Philadelphia, to see Lloyd Alexander’s manuscripts. I had been trying for a while to get in touch with the curator of the Children’s Literature Research Collection, Free Library of Philadelphia, but my emails were bouncing back. Immediately, fellow Tolkien scholar John David Cofield (whom I had never met, but with whom I had “talked” on Facebook about Tolkien before) responded to my post to say that he knew someone working in the Free Library of Philadelphia. He put me in touch with the lovely Helen Azard who printed off my email and physically handed it to the curator! At the same time, Katherine Sas responded to let me know that she lived reasonably close to Philadelphia and that she’d be willing to go to the library for me if needed. So when a bit later I realised that I wouldn’t be able to make the trip to Philadelphia, but that they were happy to admit a research assistant on my behalf to photograph what I needed from the manuscripts, Kat took on that role immediately! The chapter on Lloyd Alexander would have been so much poorer without the manuscript research, and if it wasn’t for David, Helen and Kat I wouldn’t have seen the material at all! And all of this because of a moaning post on Facebook! The second big Facebook success was related to my research on Alan Garner’s The Owl Service. I really needed to get hold of an obscure little book which shed more light on Garner’s involvement with the TV adaptation of his novel: Filming the Owl Service: A Children’s Diary. This is ostensibly the diary that Garner’s son and two daughters kept during the filming of the series (1969-70) which was then published in 1970 with contributions from Alan Garner himself, and Peter Plummer, the director. This little book has been out of print for years. Every now and then it does appear on second-hand bookshops online, usually for an extortionate price, and at that point there was just one copy on Amazon marketplace for an astronomical amount. 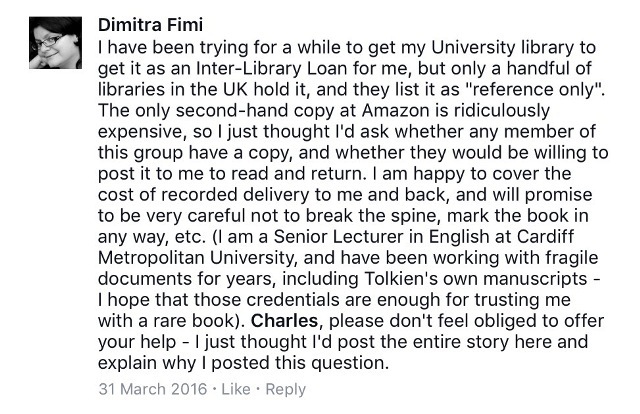 At the same time, the few libraries that held the book had it marked as “reference only” and wouldn’t consider sending it to me as an inter-library loan. And, guess what? Katherine Langrish (THE Katherine Langrish, fantasist in her own right and author of the award-winning Troll Trilogy among many other novels!) responded straight away and within two days I had the book in my hands!!! And, I got to “meet” Katherine, even if only electronically! And, triumphantly, the last one, posted at 05:20AM, exactly a year ago today! What an amazing journey! 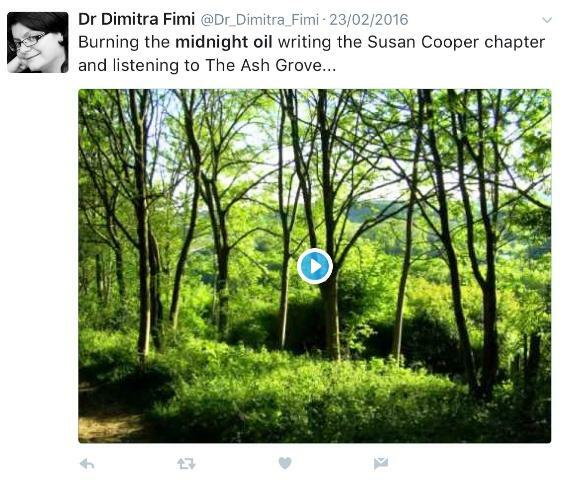 Thank you for posting this Dimitra. I am currently on maternity leave and i find this very inspiring! Terrific story, Dimitra. It is nice to be able to meet people and discuss ideas and books with them in this way.